Lithium-air batteries gain ground; growing graphene nanoribbons; graphene optical detector. Scientists at the University of Cambridge have developed a working laboratory demonstration of a lithium-oxygen battery which has very high energy density, is more than 90% efficient, and can be recharged more than 2000 times. Their demonstrator relies on a highly porous, ‘fluffy’ carbon electrode made from graphene (comprising one-atom-thick sheets of carbon atoms), and additives that alter the chemical reactions at work in the battery, making it more stable and more efficient. While the results are promising, the researchers caution that a practical lithium-air battery still remains at least a decade away. What the team has developed uses a very different chemistry than earlier attempts at a non-aqueous lithium-air battery, relying on lithium hydroxide (LiOH) instead of lithium peroxide (Li2O2). With the addition of water and the use of lithium iodide as a mediator, their battery showed far less of the chemical reactions which can cause cells to die, making it far more stable after multiple charge and discharge cycles. By precisely engineering the structure of the electrode, changing it to a highly porous form of graphene, adding lithium iodide, and changing the chemical makeup of the electrolyte, the researchers were able to reduce the ‘voltage gap’ between charge and discharge to 0.2 volts. A small voltage gap equals a more efficient battery – previous versions of a lithium-air battery have only managed to get the gap down to 0.5 – 1.0 volts, whereas 0.2 volts is closer to that of a Li-ion battery, and equates to an energy efficiency of 93%. The highly porous graphene electrode also greatly increased the capacity, although only at certain rates of charge and discharge. Other issues that still have to be addressed include finding a way to protect the metal electrode so that it doesn’t form dendrites, which can cause batteries to explode if they grow too much and short-circuit the battery. 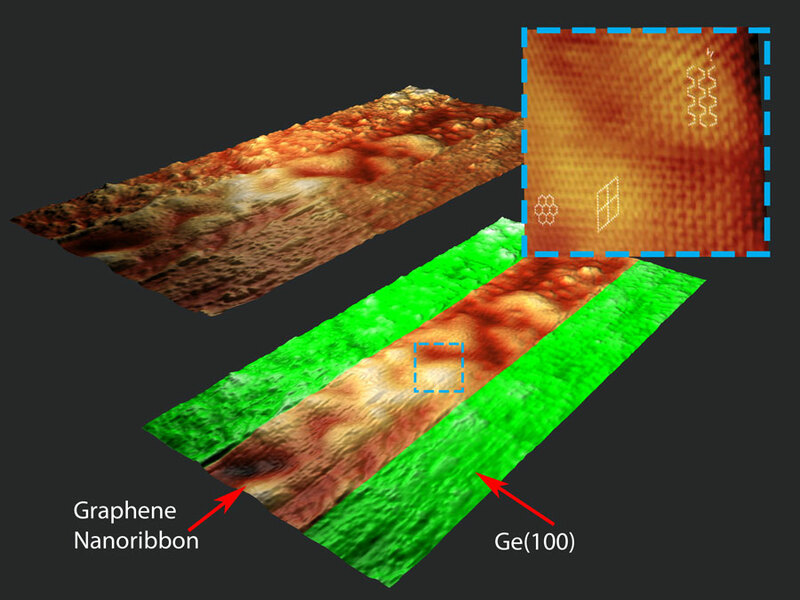 A research team from the University of Wisconsin at Madison (UW) and the U.S. Department of Energy’s Argonne National Laboratory has confirmed a new way to control the growth paths of graphene nanoribbons on the surface of a germainum crystal. UW researchers used chemical vapor deposition to grow graphene nanoribbons on germanium crystals. This technique flows a mixture of methane, hydrogen and argon gases into a tube furnace. At high temperatures, methane decomposes into carbon atoms that settle onto the germanium’s surface to form a uniform graphene sheet. By adjusting the chamber’s settings, the UW team was able to exert very precise control over the material. This comparatively simple and inexpensive construct can cover the enormous spectral range from visible light all the way to terahertz radiation. “In contrast to other semiconductors like silicon or gallium arsenide, graphene can pick up light with a very large range of photon energies and convert it into electric signals. We only needed a broadband antenna and the right substrate to create the ideal conditions,” said Dr. Stephan Winnerl, physicist at the Institute of Ion Beam Physics and Materials Research at the HZDR. How it works: the graphene flake and antenna assembly absorbs the rays, thereby transferring the energy of the photons to the electrons in the graphene. These “hot electrons” increase the electrical resistance of the detector and generate rapid electric signals. The detector can register incident light in just 40 picoseconds. The choice of substrate has now proved a pivotal step in improving the light trap. 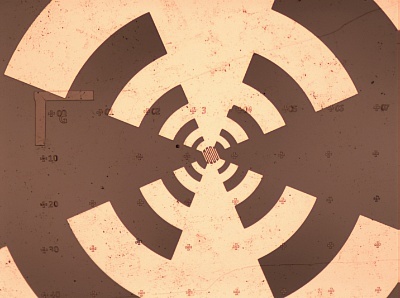 “Semiconductor substrates used in the past have always absorbed some wavelengths but silicon carbide remains passive in the spectral range,” explained Stephan Winnerl. Then there is also an antenna which acts like a funnel and captures long-wave infrared and terahertz radiation. The scientists have therefore been able to increase the spectral range by a factor of 90 in comparison with the previous model, making the shortest detectable wavelength 1000 times smaller than the longest. By way of comparison, red light, which has the longest wavelength visible to the human eye, is only twice as long as violet light which has the shortest wavelength on the visible spectrum.